Unclogging a drain from the washing machine depends on where the blockage is in the line. If the drain is backing up with water where the drain hose fits into the drain line of the house, call a plumber. This means the clog is inside the main drain pipe in the home and requires a professional. If there is no water coming out of the drain hose of the washing machine, there is an obstruction in the drain hose or in the drain pump. Unplug the power cord of the washer from the outlet. Close the water valves on the wall. Open the lid washer and remove any clothes that are in the tub. Place a big bucket up close and start scooping the water from the tub with the smaller bucket. Pour the water into the large bucket and empty that bucket as necessary. If you have access to a wet vacuum, use it to remove water from the bathtub. Empty the wet vacuum as necessary until all the water in the tub. Pull the washing machine away from the wall. 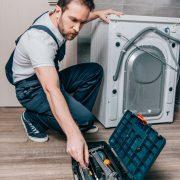 You need enough space to work behind the washer, but do not stretch the water supply hoses that connect the washer to the wall. Look for access to the water pump in the washing machine. Some will be clearly visible from the back of the washing machine. Others can be behind a standing panel in the front of the washing machine. 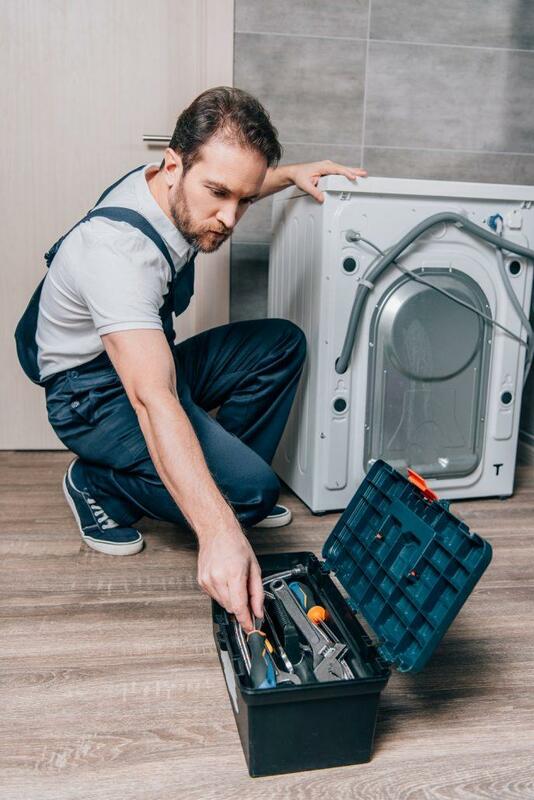 If your washer has a foot panel, insert a knife into the seam between the top of the foot panel and the bottom of the front panel. Feel for the three-inch clamping clip on each corner with the blade of the knife. Slide the blade over the retaining clip and pull the panel away from the washing machine. Place a tray under the water pump where the two hoses connect to the pump. One hose connects to the tub of the washing machine and the other to the drain hose. Grasp the ends of the spring clamps that hold the hoses to the pump with a pair of pliers. Squeeze the ends together and slide the clamp down each hose. Pull the hoses from the water pump. Water will might spill because there is little water in the hoses, as well as the pump. Have towels nearby to absorb any spillage and end point of the hoses on the tray. Look inside the water pump ports for small pieces of clothing such as socks. Sometimes small items will get between the internal and external tub and find their way into the water pump, causing an obstruction. Remove any article of clothing from the water pump and install the two hoses to the pump. Secure the hoses to the pump with spring clamps. Press the rear foot panel on the front of the washer. If the water pump was not clogged, then locate the spring clamp to attach the drain hose to the back of the washer. Squeeze the ends of the spring clamp together with the clamps and pull the drain hose from the washer. Disconnect the other end of the drain hose from the drain pipe. Bend only the drain hoses in the tube which may have a clip that rises out of the tube. Take the drain out of the hose and place the end of a garden hose, without a nozzle, on one end of the drain hose. Turn on the water and push the garden hose through the drain hose until it comes out the other end. Often an accumulation of soap and dirt is clogging the drain hose. Turn off the water and pull the hose from the drain hose. Install the new drain hose at the end of the house drain line and the back of the washer. Secure the hose to the washer with the spring clamp. Push the washer towards the rear wall. Turn on the wall water plumbing and plug the power cord into the wall outlet. Set the wash cycle to the smallest load position with hot water. Allow the washing machine to work through this cycle. The hot water will remove any residual material from the drain pipe of the washing machine. Look for a broken belt while you are looking for a clog in the water pump. If there is a broken belt, the belt should be replaced. The drive belt of the pump to drain the water. If no obstruction is found, the water pump is defective. Always disconnect appliances from the power source before attempting repairs.